Microwaves are not just used for cooking food, but for many other things as well. For example medicine, industry, science, consumer goods, and communication. In some cases microwaves can be used to treat health problems better than drugs. Microwaves are primarily used in medical cases as an alternative to surgery. For example an enlarged prostate. Instead of surgically removing the problematic organ, doctors can use microwaves to heat op the enlarging tissue of the prostate and in turn decreasing the size of the enlarged prostate. Microwaves in this field are primarily used for clean up. They can be used to decrease air pollutants, sanitize hospital waste, enhance dry cleaning solvents, and clean up polluted soil. Scientists use microwaves to make a special conductor made of copper called chalcopyrite. Microwaves can add in the process of separating chemical compounds, thus allowing scientist to individually study each component of the compound. 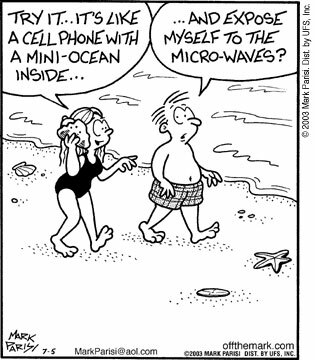 Microwaves are also in cellular phones, telephones, telegraphs, television, and satellites. They are useful in communication because they easily penetrate the earth's atmosphere. This comes in handy primarily for space-vehicle communication.